Sunshine Foods / Al's Oasis has more to offer you, the customer, than just groceries. Above all else, we take pride in customer service. Delores (pictured to the upper right) has been working with our customers for over 40 years. She is as much a trademark of the store as our 5¢ coffee in the restaurant or our sign out front. 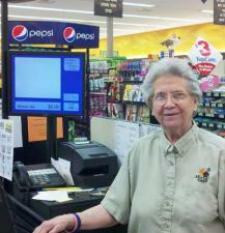 For 40 years she has greeted our customers with a simle from her checkout lane. She often refers to the customers as her boss and treats them as such. "Without the customers, I wouldn't have a job. They are my bosses." said Delores. When asked why she has worked at one place for so many years she said it was because of the customers. "I enjoy seeing happy customers. I love greeting people with a smile and seeing those who walked in without one, pick one up before they leave."